Best Secateurs – Which Garden Secateurs Should You Buy? If you’re in any way serious about gardening then you really need a great pair of secateurs. This is one tool that even novices need to buy. Keeping your garden looking great and your fingers intact are both important considerations! But just how should you go about making sure that you’re getting the right tool for the job? The choice can be tough, which is why we’re here to tell you all you need to know about buying secateurs. We’ve even got some great model recommendations! So just why should you be buying secateurs in the first place? Gardens need pruning, and anything more than the odd dead leaf and you’ll find that scissors just won’t do the job. This means that you’ll need to invest in a pair of secateurs. A good pair of secateurs is going to do two things. Firstly, they will cut cleanly and sharply, meaning that your plants won’t be mangled or damaged. Secondly, they’ll keep your fingers safe. When chopping down woody stems it’s all too easy to catch a finger in a blade, and no one wants that to happen. No matter the size of your garden (or even if you just have window boxes or balcony plants) secateurs are an essential tool. Anvil secateurs have only one blade. Whilst they look like very big scissors only one side of the pair is sharpened, the other side is a blunt curved metal surface that acts as a stable base for the cutting blade (the “anvil”). Pros: Anvil style secateurs are great for hard jobs, and essential for cutting through thicker, woodier stems. Cons: But they can be too destructive for live plants since the blade can crush a stem against the anvil base. Plus, they’re more difficult to manoeuvre. Best For: Anvil secateurs are best for destructive jobs, cutting back dead wood, or for pruning especially thick bushes or shrubs, or even small trees. Again, bypass secateurs look like big scissors, but this time both blades are sharpened, so they close and cut against each other (exactly like scissors do). Pros: This kind of tool is easy to manoeuvre, meaning they’re good for precision pruning, and also more suitable for live plants or stringier stems. Cons: Bypass secateurs will not always be strong enough to cut through thick stems, and definitely shouldn’t be used on even small tree branches. Best For: Bypass secateurs are best for general gardening, and unless you clear a lot of dead wood are probably the kind of secateurs that you’re most likely to be looking for. Rachet secateurs have a central ratchet, or a gear with angled teeth, which allow you to cut in stages. Because of this ratchet, you don’t need to exert so much pressure at one time (since the secateurs can’t “open” again). However, they can be difficult to get used to, since you cut in stages, and are almost always anvil style secateurs. You really only need ratchet secateurs for cutting very thick dead stems. Gear or power lever secateurs have gears or levers in the centre, making them easier to use. They don’t have the ratchet action of ratchet secateurs, meaning you cut in cleanly rather than in stages. Whilst gear secateurs are easier to use than even regular models, they tend not to be particularly strong and are suitable only for light gardening work. Since regular secateurs aren’t especially hard to use you’ll probably be better off skipping the lightweight gear secateurs in favour of something with a bit more oomph. Finally, you can get electric secateurs which generally come with a rechargeable battery. These are designed for use by older gardeners, or those with arthritis who made find regular secateurs too difficult to use. For the regular gardener though, powered secateurs are probably unnecessary. They are far more expensive than regular secateurs and don’t have a great deal of power, so aren’t suitable for heavier work. Fit: Depending on the size of your hands, some secateurs will simply be more comfortable to use than others. Popular secateurs models come in different sizes, so think about who will be using the tool and the size of their hands! Diameter: Secateurs usually have a recommended cutting diameter, so you’ll need to think about what exactly you’re cutting down. If what you need to cut exceeds the recommended cutting diameter of your secateurs you may not be able to cut through and may need to use both hands on the handles rather than just one (which can be dangerous). Material: There are different materials used to make secateurs. Steel is very sturdy and reliable of course, but consider aluminium and hard wearing plastics for handles since this will make your tool lighter and easier to use for longer periods of time. Safety Catch: A safety catch prevents secateurs from either opening or closing and is a good feature to have if you have kids around since it stops unfortunate accidents happening. Ambidextrous Design: If you’re left-handed look for secateurs that are ambidextrous, since right-handed secateurs (like right-handed scissors) may be difficult for you to use. Adjustability: Ensure that the bolt that holds the blades together is easy to reach so that you can adjust the tightness of the blades over time to keep your secateurs in good cutting order. Rolling Handles: Some secateurs come with a rolling lower handle that’s designed to prevent strain on your wrist when you’re gardening for a long time. Replaceable Parts: Being able to replace the spring and/or the blades of your secateurs will make them last longer, making them a longer-term investment. Holding Accessories: Loops for wrist straps or belt clips can make secateurs easier to use in the long run since you won’t have to keep picking them up and putting them down. Bright Colours: As silly as it might sound, getting your secateurs in a nice, bright colour will make them easier to find should you drop them in long grass. Blade Coatings: Coatings on the blade can help prevent rust on your secateurs, though plain stainless steel blades should be fine without a coating. Sharp Points: Some secateurs do come with sharp points on the blades, but these are usually unnecessary and can make your secateurs needlessly dangerous. Sharpening: Blades will dull over time so it’s important that you sharpen your secateurs with a whetstone or steel whenever you notice that they’re not cutting as well as they should. Dull blades can be dangerous to your plants as they’ll crush stems, but also to your fingers since they’re more likely to slip. Cleaning: If you’re using your secateurs chances are that the blades are going to get covered in sap or sticky plant juice. It’s important that you clean the blades after every use, either with an oiled cloth or with warm soapy water. Oiling: Your secateurs should have a smooth action to cut cleanly and to keep your fingers safe, so oiling is occasionally necessary. You should oil both the blades and the central mechanism to keep things moving smoothly. Now you should have an idea of what exactly you’re shopping for, so which model is right for you? Depending on your needs, we’ve got the low down on the top models of secateurs around, first summarised in the table below and reviewed in full further down the page. Before jumping into our selections though, how did we go about choosing them? We did have a few requirements. We wanted affordability, for a start. And we discounted the more specialist secateurs, looking for tools that were suitable for every gardener. We looked at brand names, since good quality, reliability and dependability are important requirements. And obviously, we looked for good customer reviews and great feedback from buyers. 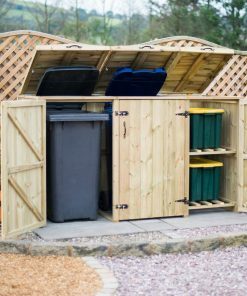 Plus, although we do sell bin stores as our primary product, we spend a lot of time maintaing our own showgarden, talking to landscapers and gardening businesses, meaning we get tons of feedback from the kind of people that use these tools every day. That being said, let’s move on to our top picks for the best gardening secateurs around! CHECK LATEST PRICE When it comes to secateurs, Felco are the brand to watch, and these are their classic model in production since 1945. 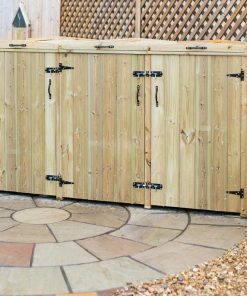 You’ve got hardened steel blades and aluminium alloy handles, making these a great compromise between robust and strong and yet lightweight. And you’re getting features too. The blades have a groove to capture sap to stop it running down the handle. The handles themselves are cushioned rubber for shock absorbance. Plus the centre bolt has a nut allowing for easy adjustment of tension. All of this and Felco offers a lifetime guarantee with all parts being replaceable. There’s a safety catch too, as well as bright red handles, so you won’t lose your secateurs. And there’s even an included adjustment key so you won’t have to go searching for a spanner or screwdriver to adjust your blades. It’s easy to see why these are the classic secateurs. In fact, the only real downside here is price, these aren’t the cheapest secateurs you’re going to find. CHECK LATEST PRICE If you’re looking for power then these are the secateurs you want. These Fiskars secateurs have special PowerGear technology consisting of a rotating bottom handle that allows you to use more force and therefore cut larger branches. The handle width is also adjustable. Blades are replaceable here, and are CrMov Steel (a blend of chromium, molybdenum and vanadium) meaning they stay sharper longer. The top blade, in addition, has a non stick coating. There’s a locking system too that keeps the blades closed when not in use. The recommended cutting diameter here is 20 mm. The only read downside here is that these secateurs are relatively large and quite heavy, meaning they’re not going to be a great choice for smaller customers. CHECK LATEST PRICE These secateurs are one of the most budget-friendly options around. They feature carbon steel blades with a non-stick coating for great performance. Add in an aluminium body with soft handle grips for light weight and comfort and you’ve got the ideal combination. Left-handers will be happy about the fact that these are ambidextrous secateurs, and there’s a safety catch too. The recommended cutting diameter is 22 mm. And though the blades aren’t replaceable there is a ten-year guarantee. On the flipside, customers report that the safety catch does occasionally come open. And whilst the price is great, these aren’t the secateurs you need if you want to cut particularly large branches since they just don’t have the power you’re looking for. CHECK LATEST PRICE Japanese secateurs come with a hefty price tag, but professionals consider them some of the best around, and Okatsune is the most well-known of Japanese brands. These secateurs are classic bypass pruners with a clothespin spring for added durability. Blades are not replaceable, but they are made from top end carbon steel and keep a very sharp edge (caution is necessary!). There is a bottom mounted safety catch, however. The coated handles are comfortable to hold and non-slippery, and the bolt is easy to adjust. Plus, these secateurs are ambidextrous and come in a range of sizes too. The real negative here is simply the price. These are some of the best secateurs that money can buy, but they’re really not cheap. But Okatsune are a great choice for serious gardeners. CHECK LATEST PRICE If you’re looking for something with real power, then these Spear & Jackson secateurs should fit the bill. They are ratchet operated, meaning you can exert more power, though the ratchet action does take some getting used to. A looped bottom handle makes opening the blades easy, and the carbon steel blades whilst non-replaceable do have a non stick coating. The top handle is covered with non-slip plastic, and the safety catch is sturdy. The recommended cutting diameter here is 20 mm, which for some might be too small for a tool that has this kind of power. Downsides? The bottom handle has no covering and can be hard on the hands, and you really need big hands for these secateurs. Plus, these pruners are really only suitable for dead wood since they’re simply too powerful for live plants and will crush stems. CHECK LATEST PRICE Our second entry from Wilkinson Sword and these secateurs are an excellent basic buy. They’re affordable but really get the job done. The Japanese steel blades are not replaceable, but they do retain a great edge. Plus, the straight narrow blades make these the secateurs you’re looking for to do precision work in tight spaces. The aluminium handles are comfortable to hold and keep weight down, and the safety catch has two settings (either keeping the secateurs closed or limiting them to half opening for easier cutting of smaller stems). Add in a neat rubber buffer that acts as a shock absorber on the spring and these are a dream to use. These aren’t the secateurs for serious dead wood, and the diameter is limited to 22 mm, but they are an excellent basic all-around tool. These are right-handed only! CHECK LATEST PRICE If you’ve got a lot of heavy work to do then these Stihl secateurs are going to be your best bet. With a top recommended diameter of 25 mm, these are some of the biggest secateurs around. The blades are chrome plated for extra sharpness and robustness and are replaceable too. You get the option of wire cutting as well, with a notched blade, as well as a channel to collect sap and keep it away from the handles. And those handles are both plastic cushioned so they’re non-slip and cushioned so they’re comfortable to use. The safety catch is very solid and keeps the blades firmly closed. These aren’t the cheapest secateurs you’re going to find, and given the large cutting diameter, they’re really not for smaller hands either. But in terms of power and ability to get the job done, these are a great choice. CHECK LATEST PRICE If you want to do some hefty cutting but you don’t fancy the jerky action of ratchet secateurs, then these Spear & Jackson geared pruners should be just the ticket. The gear action makes for smooth and yet powerful cutting, and there’s a ten-year guarantee too. The body of the secateurs is lightweight aluminium, and the blades are steel coated in non-slip Teflon. There’s an excellent safety catch too, so keeping them closed is no issue. Finally, these are ambidextrous. All in all, these should be everything you need for cutting even the mightiest of stems. On the downside, you will need big hands to work with these. And since the handles aren’t covered they can get uncomfortable to use after a while. These are anvil secateurs and not really suited to live plants. As always if you have any questions about any of the secateurs listed here leave a comment below or contact us via our contact form.